London’s calling! And it’s a high standard of work which greets me when I step off Holloway Rd, and into the Met. 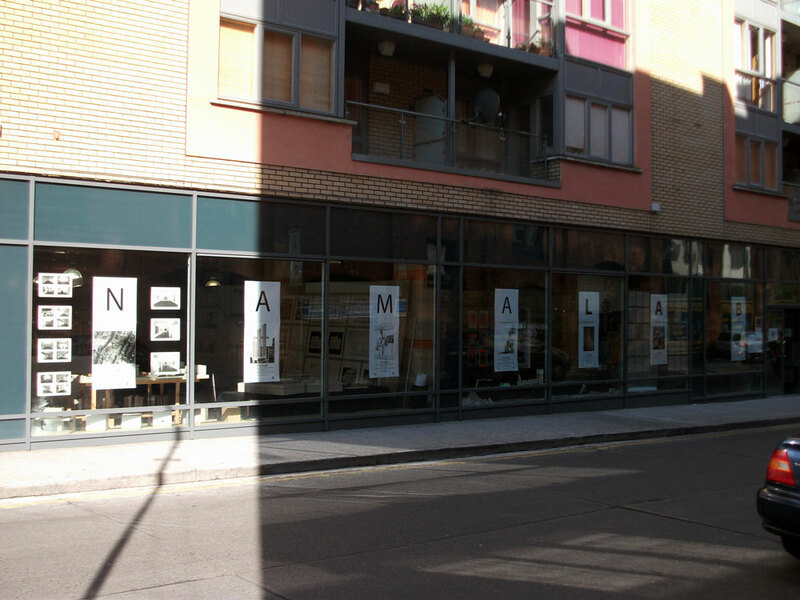 It is worth noting this unnervingly uncommon fact – the Met architecture exhibition space, like this year’s Dublin NAMAlab exhibition, boasts streetscape! Accessible, inviting street frontage, AND it taps the hussle of Holloway no less! Arch exhibitions e x p o s e d. Excuse me while I regain my composure ahem. What is particularly true of the Met show, compared to most schools visited this season, is that units and students seem to have focussed on disarmingly specific lines of enquiry; fascinating subject-matters tantalizingly-palpable in these curated volumes. This is the show with the most amount of students viewed to date, and it’s a show that has taken deliberate care to present an exhibition with a capital ‘e’. Having toured a fair number of schools so far, I felt that deliberate absences became one of the meta-themes; bodies of student work were reduced to a selection of drawings and text, and omissions of labelling individual students work and individual drawings [sometimes in favour of a key/legend drawing on the end wall, sometimes in favour of no labels, or carefully concealed labels]. And I ended up rather liking all this reductionism. Although, that was despite the added hassle this gave me to reverse engineer the student’s identity du temps en temps. This presentation style was in effect for several of the units, where greeting the viewer would be a matrix of un-captioned drawings. Anonomyity or perhaps collectivism, coupled with an economy of display space seemed the immediate impetus for the presentation choice. The best example of this I found was the Orford Ness unit/room – which seemed to subtly subvert the usual architectural exhibition. David Grandorge is unit leader for the Orfordnessers. Their room’s composition had that harmony of parts, a clarity of composition not usually associated with large group displays. Models and wall laid pieces seemed to collectively voice a homogeneous message of eerie and often beautiful proportions; quite fitting for the Orford Ness site, a framed juxtaposition of landscape and military experimentation. I’ve said nothing of the stories these graduates impress on the viewer with their individual research projects, and so I suggest you read further into these. Milling and mulling, many people meandered around the rest of the show, where you’d find several delights in each unit. From Florian Beigel‘s group, Louis Jobst displayed exquisite excavation and reforming drawings, while Unit1o’s students, tutored by Signy Svalastoga & Joerg Maier, playfully dispersed and concealed their exhibition amongst hoards of drawers and cabinets. Perhaps most of all I was impressed by the wall of Rosie Hervey’s drawing explorations – unashamedly the thought-processes are displayed, unfinished fragments of representation experiments were a breath of fresh air. There are many more students to name and praise – find out for yourself before the show closes 7th July! The architecture campus at UCD was in summer mode when I arrived. The end of year exhibition was still on – although this information was not readily available – and I found myself wandering alone through the quiet spaces of an architecture school empty of the students whose work now hung on the walls. This atmosphere was somehow appropriate, as much of the work was understated and reflective in a way that requires of the visitor a particular form of considered, personal engagement. 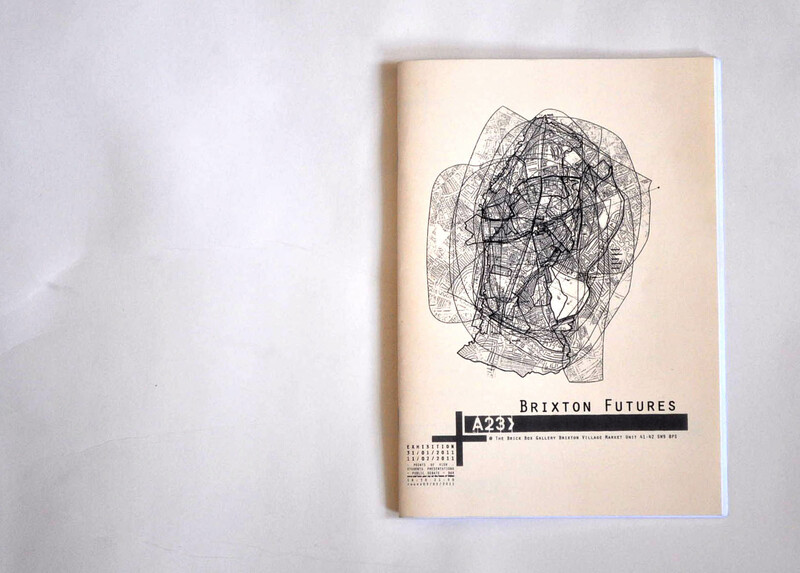 Professor John Tuomey writes that ‘Strategies for an Urban Society’ was this year’s “thematic preoccupation” in the school, and it is possible for the visitor to recognise this is in the projects, if implicitly. 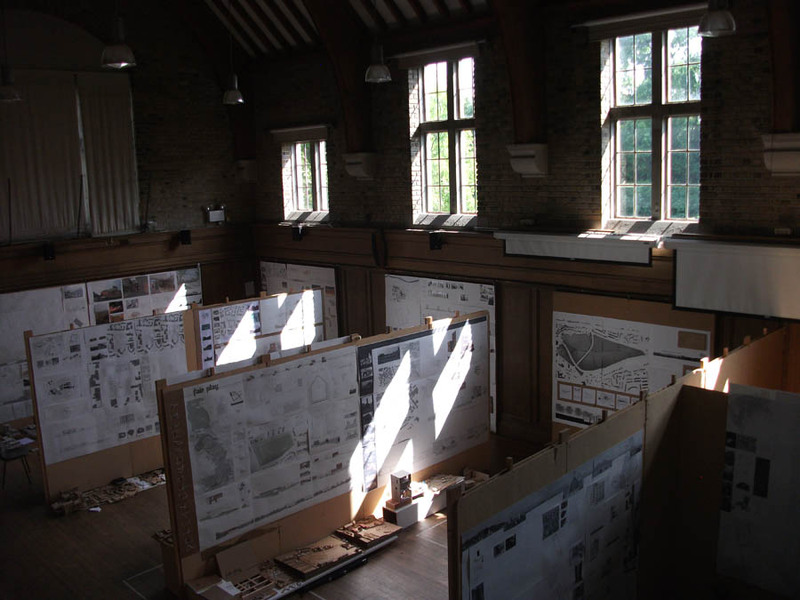 All five years of the school were represented in the exhibition, with work distributed throughout the diverse spaces of three buildings which surround an arboreal quad. The lower years produced an impressive array of models and large-scale pencil drawings, and it is clear that much emphasis is placed on the student developing traditional drawing skills which are later supported with digital drafting technique. The fifth year BArch(Hons.) group is divided into 11 thesis units of five students and two tutors, and the projects are clearly involved with the balance of context, techne and personal agendas within the intellectual frame of units named as points of poetic departure, including ‘Ground’; ‘Courtlife’; and ‘Measure’. 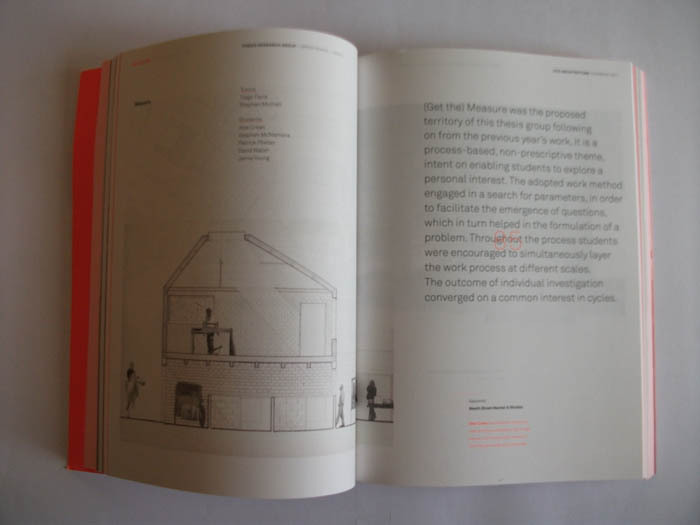 The school have produced a 288-page publication edited by tutors Marcus Donaghy and Deirdre McKenna, and elegantly designed by Dublin studio Conor and David. 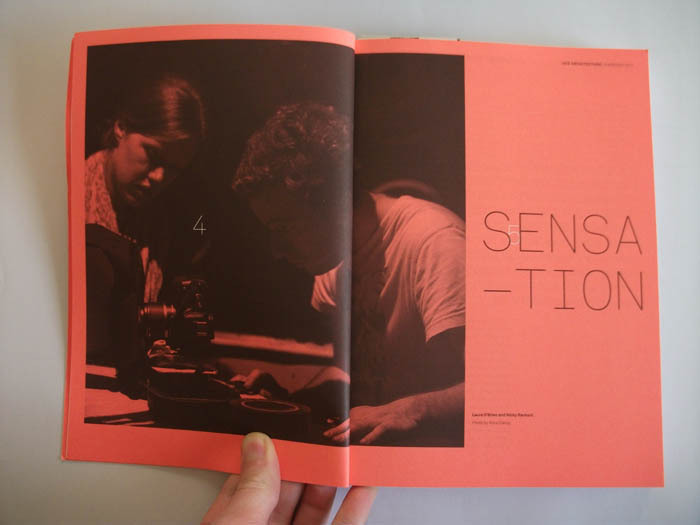 Imagery of the students’ projects is accompanied by inserts on various workshops, and by a series of engaging and cogent texts. 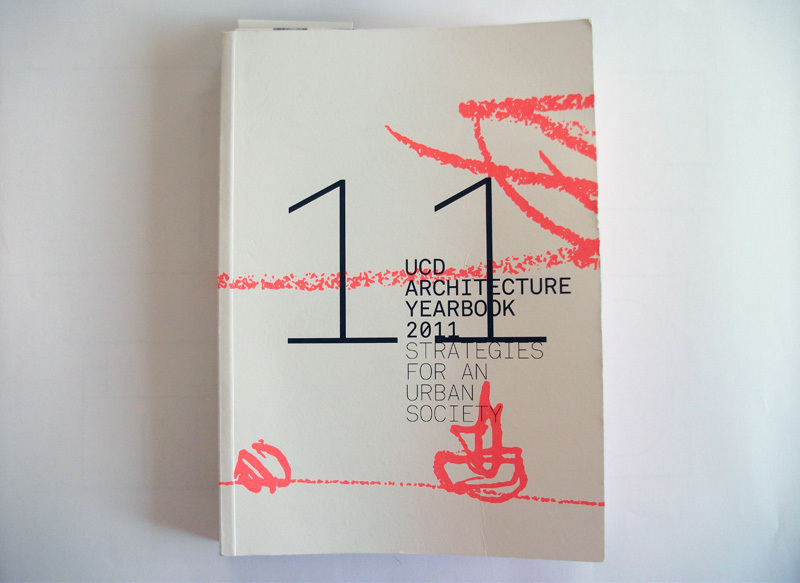 Included among them are a poetic lecture on Le Corbusier by Nicholas Fox-Weber; a discussion on the nature of the architectural vocation with visiting critic David Chipperfield; and a charming exposition on the personal and social in architecture by a man of science, UCD Registrar and Vice-President Dr. Philip Nolan. 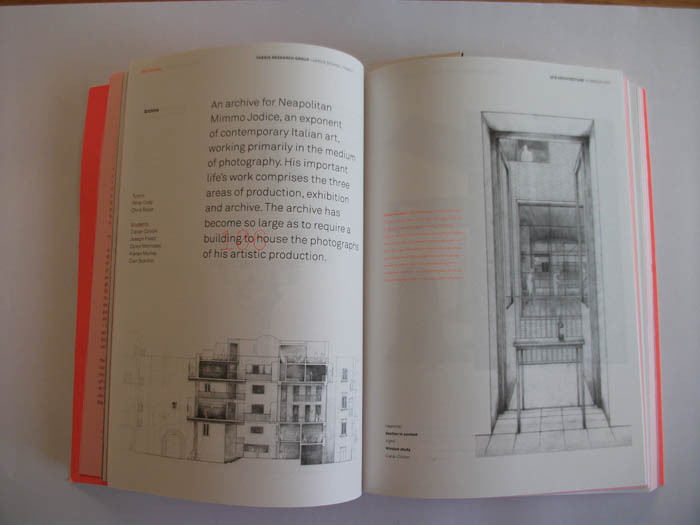 The exhibition and the book provide to the visitor a unified impression of a school concerned as much with developing critical awareness in subjects in and beyond architecture as with exploring the craft of buildings for the poetic quotidian – with the best of the final-year projects achieving this in exquisite, exemplary resolution. As is now ritualistic [and somehow sickly pleasurable], to find the architecture exhibition at Sheffield, Max and I had to meander curving corridors and stacks of steps. The exhibition was housed in one massive mezzanette, with year 3 on the upper landing, and years 5 + 6 spread across the lower level. The exhibition of years 5 + 6 was well spaced, divided by ‘studio’ [not to be confused with ‘unit’], helped by clear labelling of work and thoughtful, considered layouts. 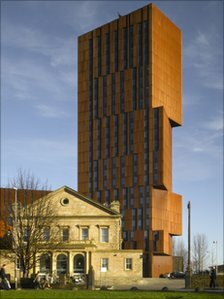 Max and I were met at the exhibition with next year’s MArch course leader Satwinder Samra and current MArch course leader Russell Light; we were treated to some Sheffield insight; into the school, studio and pedagogy ethos. After also speaking with a few of the students present I effortlessly remain optimistic, impressed by this school’s courtship with architectural education. The work looks good. 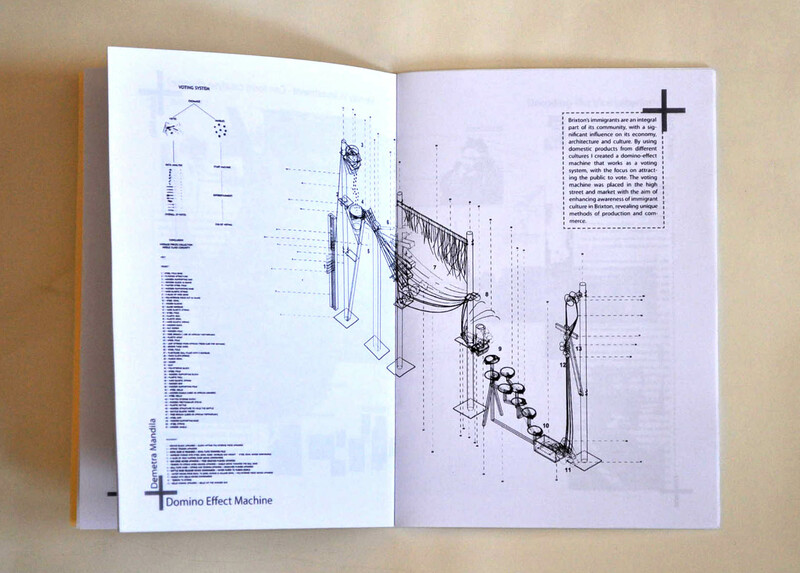 The 90 page school publication is a collaboration between staff and students – it reads like a ‘year book,’ is designed in-house, and somehow represents the hoard of student studies in a composed, readable way – anyone who has attempted to design the infamous architecture year book will know just how tall that order is! Sheffield “remains amongst the oldest architectural schools in britain (Architectural Association, London 1847, Liverpool 1895, Manchester 1903, Bartlett 1911, Birmingham 1909, Cambridge 1912),” states the centenary publication by Peter Blundell Jones – I wonder if this age, the inferred maturity, has some thing to do with how comfortable it was to spend a time walking around this show. Manchester’s school of architecture seems to be part of the art school, or at least the art school degree show and the arch degree show shared the same complex of buildings. 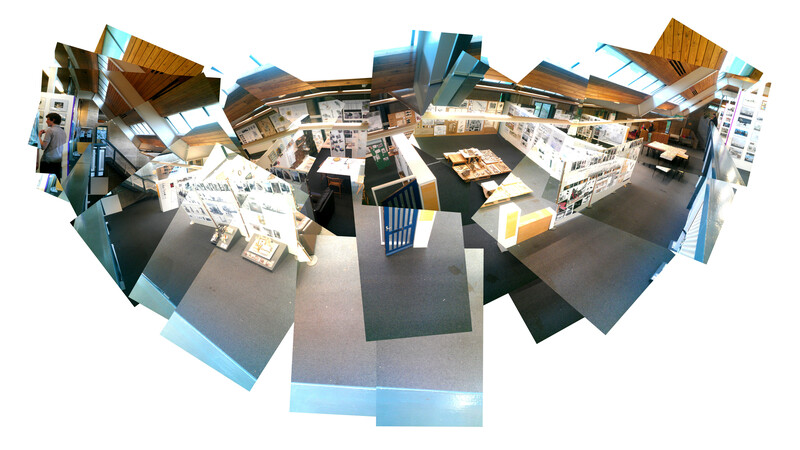 The arch student’s show was spread across several rooms between floors 5,6 and 7 – roughly following the rule of one room per tutor group. To set the scene, on 21st June when Max and I visited, this was a hot, sunny day; but all the windows to the rooms were screwed shut! [to keep dust from a neighbouring building site filtering in]. Perhaps losing a pint of water from my system affected my mental state – but I thought the exhibition here looked confident and exemplary in parts. A wee bit disorientated by my new surroundings I was thankfully directed by tutor/practising architect/all round prolific Nick Tyson and the helpful principle lecturer Colin Pugh. 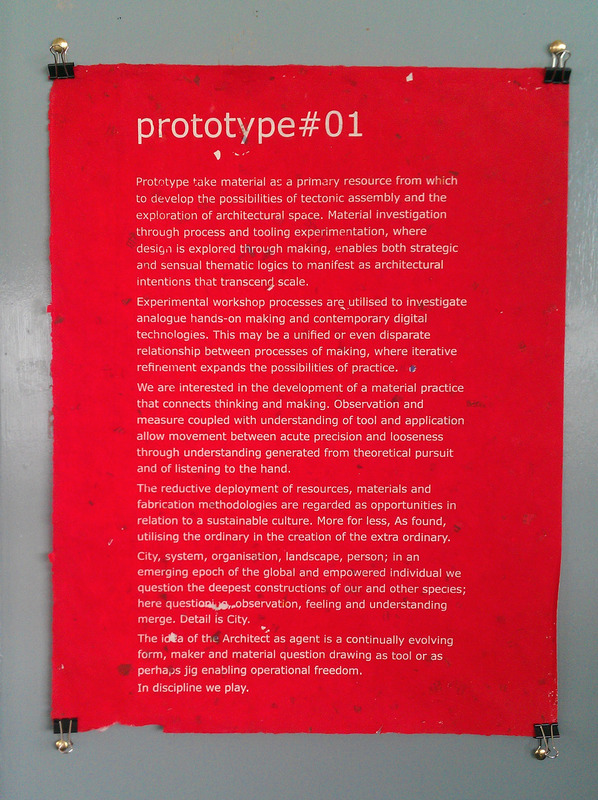 Nick, along with partner Ming Chung, lead the Masters unit ‘Prototype #01.’ This unit, above the others, gripped my attention for several reasons i* i was able to speak with the unit’s tutor and gain that insight to it’s inner workings [the unit’s pedagogy sounded fascinating and experimental] ii* this unit really made an exhibition of their show, where in some cases the other units read like final pinups iii* they had a bigger room than other units iv* the students’ projects had those tell tale signs of people enjoying what they do! 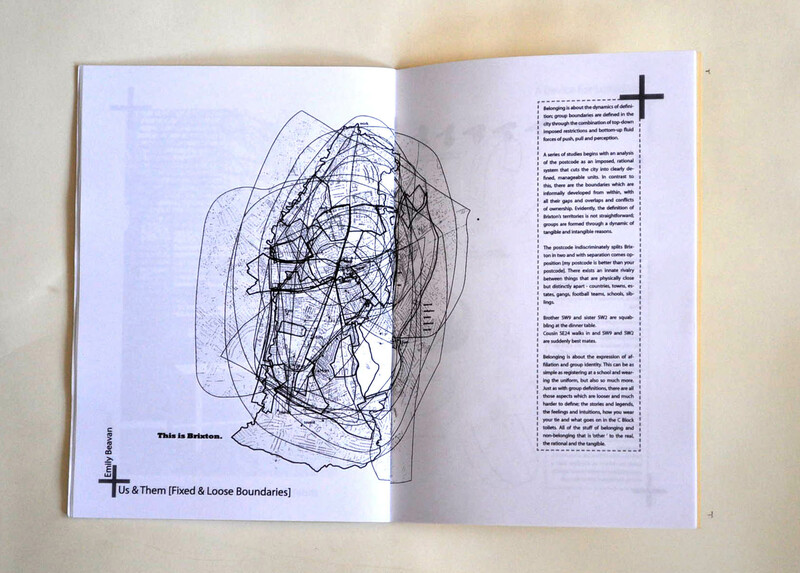 Of course, elsewhere there were signs of great things to come too; I found the most promising sketchbook to date by Rose Tran in one room and a highly provocative ‘body-donor excel questionnaire by Felicity Hurling in another unit – perhaps this too is a drawing underutilised by architects? 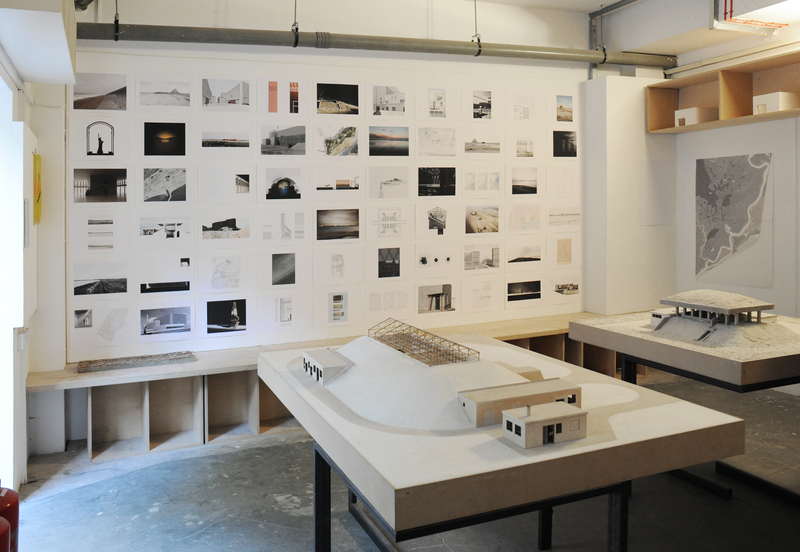 The DIT Graduate Show – comprising of work from architecture and architectural technology – is divided between the main building at DIT Bolton Street, DIT Linenhall and a vacant ground floor commercial space on King’s Inn Street. There is an extensive amount of work on display, covering the two degree courses from first to final year. Generous wall and floor areas are available for the graduate work, particularly so at the King’s Inn venue, an unfinished and fully glazed space with street frontage.Of particular interest was the work of fifth-year BArch(Hons.) students carried out under the ‘NAMAlab’ initiative. The students considered in their projects proposals for the development of unfinished buildings and sites procured by the state from private developers during Ireland’s recent economic collapse. I had the good fortune of being guided through the work with erudition and enthusiasm by graduating unit-members Olivia and Helen – who were invigilating while groups of local school children were investigating, with typical brio, the many large-scale models on display. It was an experience to witness the ease by which the children had entered the exhibition from the street, by way of their own volition. This is a feat often rendered unlikely by the usual maze of corridors and stairs in university buildings. An enjoyable range of individual approaches to drawing and model-making was exhibited, with a considerable proportion of analogue imagery, and several exemplary models. It was clear that in many cases students had actively pursued methods of representation and presentation appropriate to their particular projects, and personal agendas. Having a3 thesis documents available allowed the interested visitor to trace related influences and design development. Overall, it was a well-presented exhibition with many projects that displayed a high degree of technical awareness and ambition while remaining engaged with – a very real – contemporary Ireland. 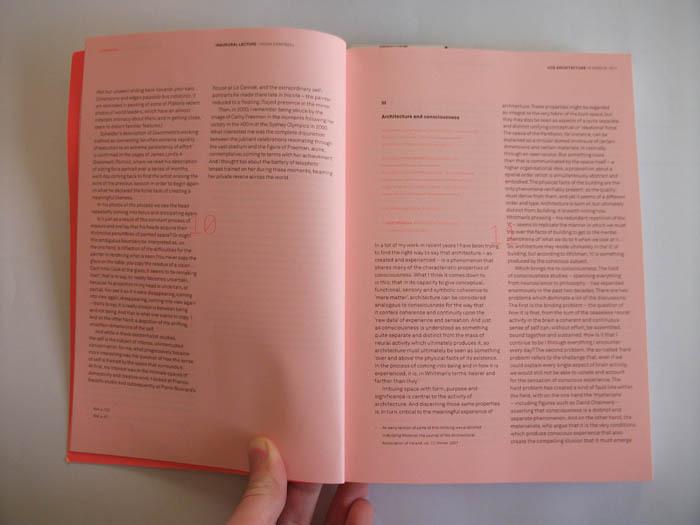 A group of NAMAlab graduates and tutors are currently working together to continue the project and a publication is currently being prepared for release this summer. The exhibition continues until Friday 24th june. the sun was shining as we arrived in birmingham, and we enjoyed the walk to the university campus which, although short, took us past the magistrates courts, a spectacular building with a peculiar window feature, as well as Lancaster circus – a massive and fantastic flyover passing above the subway. happily, we had arranged to meet three students at the Sacks of Potatos, a pub right next to the architecture school. meet them we did, and following a bit of chat over a pint, they kindly showed us round the three postgraduate unit’s work, a day before the show was due to open. like Bath, the display was an adaptation of the years final presentation, and wall space was at a premium. despite this, most of the students had been able to provide a good account of their projects in the space provided to them. drawings by computer were the order of the day, with the diversity of digital tools on display reflecting the wide ranging interests of the individual students. 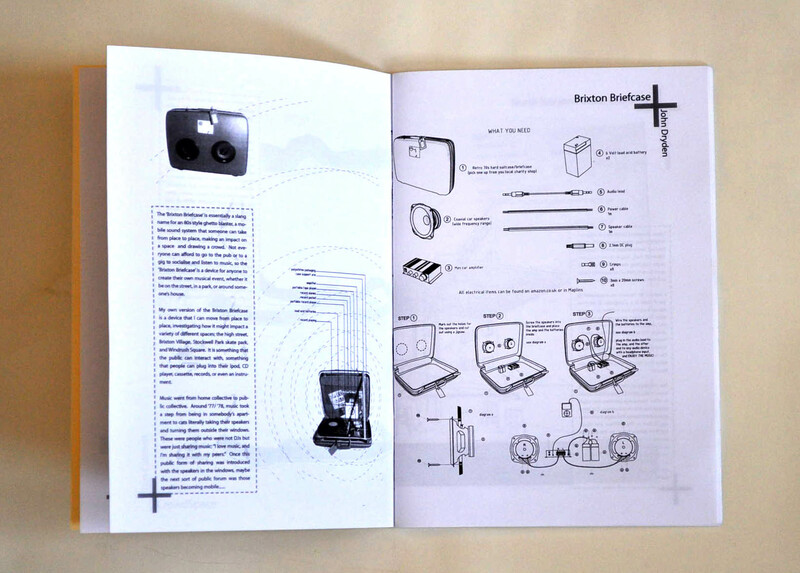 as well as this, many of the students had developed inventive and sometimes peculiar prototypes or devices within their projects, and also had their sketchbooks on display. it was great to see how these different ways of working informed and complimented each other within the range of individual projects. Returning to the Sacks, the students reflected on their education at Birmingham, speaking highly of their tutors and the course, and criticizing only the lack of space within the department. This positivity is apparent in much of the work on show here, and will be a valuable asset, once the school moves into a new building, which we are reliably informed, it will soon do. the postgrad dip degree show was split across two rooms, which itself was somewhat divorced from the BArch [hons] degree show, up on level 5 of the tower – luckily we were guided by a befriended, knowledgeable student. thanks greg! for me, the vast majority of leeds met graduates presented their work in a way that spoke of work-left-up-after-a-final-review, rather than an exhibition; even though it is in fact an e x h i b i t i o n which one might expect to be treated to, given that ‘pg dip architecture’ is advertised as part of the broader creative arts festival. there will be released a leeds met yearbook showcasing the undergraduate and postgraduate work from these last two semesters. brighton’s architecture students were exhibiting in a purpose-built timber pavilion, in the central courtyard of the art college. it’s great to see evidence of time and effort spent designing an exhibition, separate from the outcome. unfortunately i was visiting during a wet, windy day – the weather was taking it’s toll on the pinned and riveted students’ drawings. there seemed to be a strict layout format for the student’s drawings; all the pages fit onto a modular of a1 landscape sheets, i’d say quite densely arranged. architects and architecture schools often subscribe to this orderly composition, and i wonder why. there are no doubt thoughts of wall space efficiency, of classical ‘neatness’ and group cohesiveness amongst other things considered when putting these displays together, but i have found it is often, though not always, an exhibition’s poisoned apple. individuality, breathing space for drawings and drawing-medium diversity are all too often the victims of such widespread aesthetic assaults. this is a general comment. why do architecture students use plotters so much? as far as i could gather, the graduating part ii students at brighton constitute one unit which this year have studied the london borough of brixton. having cycled through brixton [where i was attacked by a punctured 700mm 23c tyre] on my way to brighton, i found this group study pretty cool – because i had been there! some of the drawings or drawing techniques, in model form or paper space, were adventurous, i thought. worthy of a stare and a ponder. i wish there had been some architecture students invigilating the exhibition. Halfway through our journey to Bath (as the coach made its way through Swindon) we contacted, one of the students that had been in touch regarding the exhibition. He informed us that, contrary to the information on the university’s website, the work was already being taken down. Following a brief flurry of phone calls, we were put in contact with another student, who agreed to reinstall some of the work, and to meet us at the uni. Having stopped briefly to admire the faculty building by Alison and Peter Smithson, we met our guides who showed us round the remains of the exhibition, describing the structure of the course, and their reflections on the university’s approach. They explained that the course places much of its emphasis on the feasibility and resolution of each project, this supported by the evidence of the final year reports, impressive and detailed documents containing the research efforts that contributed to the student’s work. Looking at the drawings, it was immediately apparent that many of them had been produced using a computer. 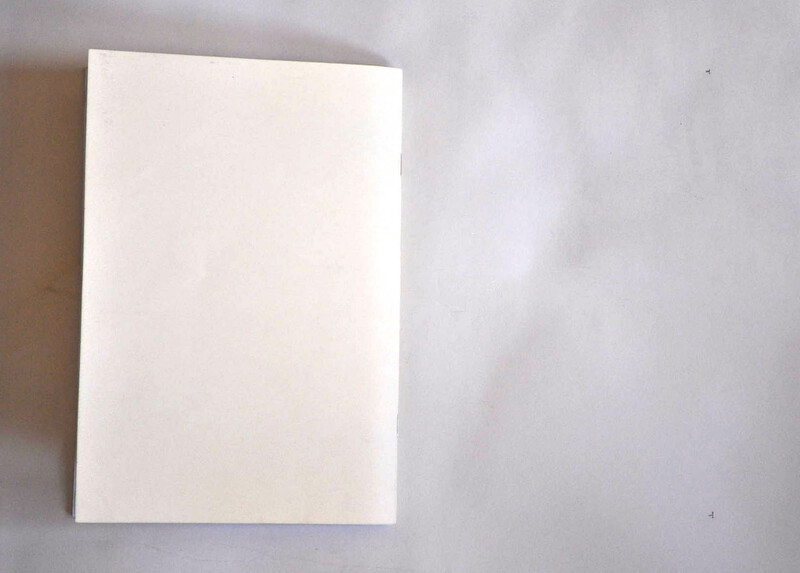 The ensuing conversation revealed that the school did not provide a wide range of drawing classes, and as such many of the students learned their drawing techniques from one another. This was all the more pertinent when we learned that our guides also lived together, had displayed their work next to each other, and utilised similar drawing tools to one another in the making of their work. The students at Bath are encouraged to gain work experience early on in their education. We speculated that this early exposure to the reliance on cad within the industry may further inform the skills and techniques that the students subsequently develop and share with one another. 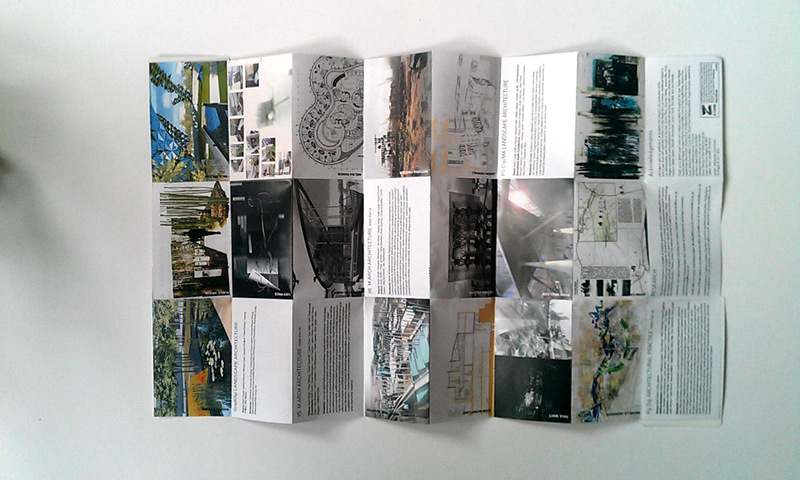 This emphasis on the ‘real world’ side to architecture is apparently a fairly common criticism of Bath, although our guides felt that there may be a reaction against this dry typecast within the approach of the students, many of whom had produced high quality computer generated renderings of their projects. At some point, it transpired that the exhibition was largely formed as a roll-over from the students final crit of that year. Whilst similar, this is not the same as an exhibition, and the way in which the work occupied the space did reflect this. The fact that much of the work was removed prior to the closing date of the show of course distorts my impression of the complete exhibition, however, a further show of Bath’s work is planned to take place in London in the near future, and I will be keen to see how this compares to the display that was put on in their own school building.